This winter, many frosty facilities welcome everyone in Budapest for graceful (or even clumsy) gliding citywide, including a couple of particularly panoramic ice rinks where you can skate for free. Here is a comprehensive guide to nine indoor and outdoor ice-skating rinks in Hungary’s capital, including opening hours, duration of availability, and the cost (or lack thereof). Europe’s largest open-air ice rink, which is one of the most spectacular ones in the world thanks to its beautiful backdrop of Vajdahunyad Castle, celebrated its 90th birthday last year. For this outstanding occasion an exhibit opened on the sidelines, showcasing pictures of the most important events in the history of the venerable ice rink. Now tickets are available for purchase online as well, which helps to skip the lines on the busiest days (Friday, Saturday, and Sunday). Buda Ice Rink is located on Széna Square across from the Mammut 2 shopping mall, between the bus station and the old city wall, which means it’s easily accessible by public transport. Open until spring, this rink can be rented by amateur hockey players to have a nice little game, and the 30-meter-long ice surface is also suitable for corporate events, according to availability. During the unoccupied periods everyone can skate around. Jégterasz moved to Kerepesi Road a few years ago, and here frozen hearts can be melted during the ice discos on Friday and Saturday nights. For beginners it’s best to visit in the morning, when they provide free group classes to help everyone taking their first steps on blades. The 1,200-square-meter icy surface can be rented for private events as well. When it comes to skating, residents of Budapest’s Csepel Island district have it good. Here anyone can use the 25×30-meter-large rink next to Csepel Supporters Arena for this season, and some say it’s the scaled-down version of the Vienna ice rink. What’s new this season is the 2.5-meter-wide and 150-meter-long ice corridor – after racing through it, we can relax next to the rink with hot drinks and Transylvanian chimney cake. For those who can’t make it during the winter, or just simply want to skate in T-shirts when there’s nice weather outside, there’s the ice rink of Pesterzsébet open until May. It mainly serves educational purposes, but of course, the weekends are about public skating and ice disco. The ticket prices of these latter programs also include a cup of hot tea. The 450-square-meter surface of this rink is covered with a tent, and among the rinks with entry fees, this is one of the cheapest in Budapest. Keep an eye on the availability table though, as this place is pretty busy, and besides skating, they also have hockey workshops (the first skating class is free for everyone on Saturdays). 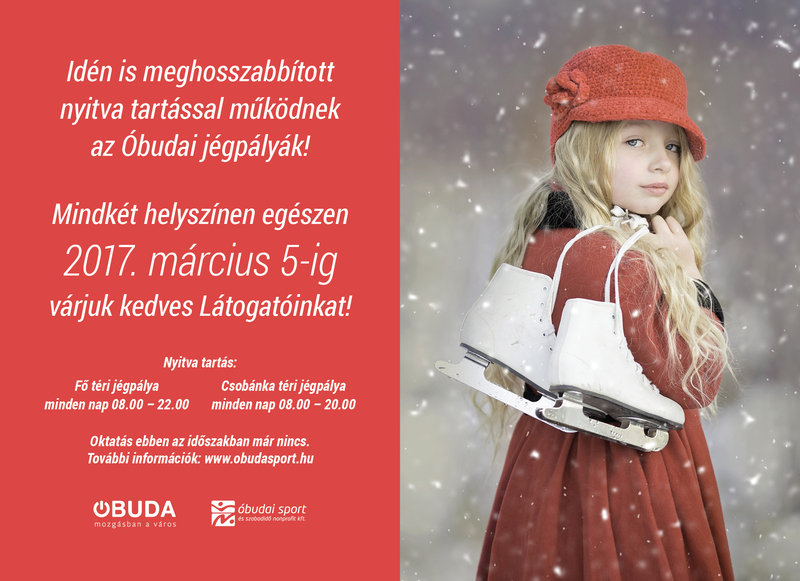 For those who always want to skate, the season doesn’t matter in Káposztásmegyer, as the Ice Center is open all year round. However, it’s definitely worthwhile to get informed before going there, because due to classes and practices the ice is often occupied on weekdays, but on the weekends it’s more likely that the ice rink is available. The largest free ice rink of Budapest also features some of the most beautiful riverfront views of the capital, and what’s more, we can skate here on the Danube Bank until we get tired, as there’s no time limit here. While skating on the 450-square-meter ice surface, we can admire Gellért Hill and the Liberty Bridge, not to mention the intriguing Balna building itself. To enhance the excitement, they also have ice discos beginning early in the evening. This is another rink that’s free of charge (which also means that it’s not that large), set up in the middle of a historic square of a north-Buda district surrounded by beautiful old buildings. The Fő Square ice rink of Óbuda is one of the three in this area, and it’s open until the beginning of February.